The daughter of a woman killed in a crash on the A31 has paid tribute to her. Lewis Faulker, 25, has been jailed for causing her death. Hampshire Police are investigating a fatal collision involving three vehicles. The accident happened on the A31 southbound between the Chawton roundabout and Four Marks Village last night. The emergency services were called to the scene at 6.52pm. One man died at the scene. A man and a woman are in hospital with minor injuries. The road was closed in both directions until the early hours of this morning. Surrey Police is appealing for witnesses following a serious collision on the A31 in Farnham yesterday evening. Officers were called to the scene at 7.35pm following reports of a multi-vehicle crash, one mile west of the Coxbridge roundabout. It is believed that a silver Volkswagen Polo travelling from the Hampshire direction towards Farnham, crossed the carriageway and collided with a number of other cars. Emergency services, including the air ambulance, were on scene and the road was closed for more than ten hours. The A31 westbound at the New Forest in Hampshire remains closed because of an overturned lorry and recovery work between M27 J1 / B3079 (Cadnam) and A338 Salisbury Road (Ringwood). The A-road has been down to one lane since 4:30am, but a full closure is now in place from M27 J2 via the A35. The road is not expected to reopen until about midday. There is only local access to exit the M27 at J1, and to/from the A31 in the New Forest. Diversion in place: from M27 J2 Ower, follow the Hollow Circle Symbol via A326 to Totton and A35 south via Lyndhurst towards A338 at Bournemouth. More than 70 new signs are being put up on a notorious stretch of road in the South to try and improve safety. It is hoped the new signage at Ringwood on the Hampshire Dorset border will help to reduce the number of accidents along the A31 between the Ashley Heath roundabout and Burley. There have been a number of fatalities on this stretch of road in recent years - including 16-year-old Jade Clark who died after being knocked off her moped in February last year. Here's Martin Dowse's report. The interviewee is: Councillor Michael Thierry, Ringwood Town Council. A local man has died in a crash on the A31 in Dorset. It happened last night between Winterbourne and Bere Regis. A blue Subaru travelling west tried to over-take a lorry but hit a Skoda travelling east, pushing it off the road. The driver of the Skoda died whilst the two passengers was seriously injured. A Mercedes was also involved in the crash, being pushed into a ditch by the Skoda. 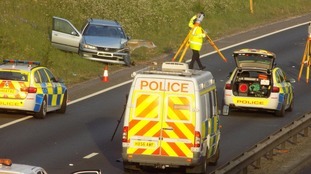 The A31 was closed last night as Dorset Police carried out a full forensic traffic investigation. They also believe another car may have been inconvenienced, described as a small green hatch back. They are keen to talk to the driver of this car or to anyone else who may have witnessed the crash. Pleased call Dorset Police on101 with any information.